I have added the OPTi 82C291 v1.43 image in my list post here , this was only possible because pixelmischief send me the SBC card he got - so the credit is his! a. the motherboard chipset is the 82C291 + 82C206 but the BIOS reports it's for the "OPTi 349 chipset" , maybe an internal name or does this chipset also exists so the BIOS can be used in both? b. I include in the archive 2 dumps, a .BIN made with some programmers and a NSSI .BIO image - there are some bytes different , maybe they don't matter and it's just the way they are accessed by either the system or the programmers but it's better to have both just in case. The .BIN file is the same with all 3 programmers I tested, original eprom is an AM27C512. Anyways it's nice to add yet another dump, I hope more turn out in the future! I was searching for for a newer bios for my Intel advanced/as Atlantis motherboard, the version i have now is a Ami 100.06.cl0 and i wanted to get version 100.07.cl0but unfornately i can not find it on the internet but what i found is a MR-bios version for this motherboard called MR_ATLAN.ZIP, is it worth it to try? In the MR_ATLAN.TXT file they warning it's possible to damage the motherboard as the bios eprom is soldered. Ah. MR BIOS for OPTi 291. I believe my Alaris Leopard board uses the 295. Too bad, I was so close! And speaking of Alaris, I believe I have found a copy of MR-BIOS for one of their boards called "Tornado 2". From what I can tell this is a 486 board based on an EFAR chipset, but I haven't determined which one yet, but it should be EC802GL. you can try but be prepared for the even that the mobo won't boot correctly or even at all. To be sure install a socket for the BIOS rom - use a programmer to dump the original one and write the MR-BIOS version. If it does not work then just write the original one from your backup. In an unrelated note I got an OPTI 495XLC based mobo (BEK-3739) with a TX486DLC/E cpu and the mr-bios image worked fine - a good upgrade from the original AMIBIOS. There was some funny business going on with that mobo and it's cache size - there was some rework on the solder-jumpers on the backside and eventhough amibios reported 128kb the actuall size was 32kb. So it was 1/4 fake cache Restoring the jumpers and using a set of good and tested 125kb sram ICs all went back to normal. The TX486DLC/E cpu gets INSANELY hot, wtf... stable though! Yeah it does. I personally don't run a DLC without a heatsink, although I assume it is fine without one because that's how I always seen them installed. kixs wrote: I'll check my boards for Mr. BIOS. Although only 3-4 might have it. Over the weekend I played a little with Alaris Cougar II 486BL that seems to have Opti 82C499. Do you (or anyone) have BIOS dump for the RYC/Alaris Cougar II 486BL or make it? I've got similar motherboard but with BIOS and some other chips been removed. All parts except BIOS are found, after power up nothing smokes and the board trying to read something from empty ROM socket. Which image should be flashed into 27C512? Google didn't helped me. Here is the MR BIOS for the Alaris Cougar (not sure which revision), but it has the OPTi 82C499 chipset. This is from Michal on the OS/2 Museum website. Thanks very much! The motherboard is now trying to start, but fails due to RTC chip. It has fried even 2 chips, one was unplugged from a died mobo and other was working until I had installed it into the Cougar and now it is not visible even by the donor board. It's "MR BIOS (r) V1.65 OPTI481 04/18/94 Alaris, Inc." (read from raw strings in the dump). The board revision probably is same as shown in the OS/2 Museum which is similar to mine. Added it to the index post, thanks Anonymous Coward! I also got an Alaris Leopard mobo with the 66mhz SLC2 cpu - I hope one day we also find a suitable MR-BIOS for it! - the OPTi 439 SBC I posted about is "OPTi 82C291 SxWB Single-Chip WriteBack with 82C711 Combo I/O"
- the OPTi 481 Alaris Cougar is "OPTi 82C499 DxSC Single Chip with 82C711 Combo I/O"
Great to see that there are already so many MR-BIOS dumps saved! 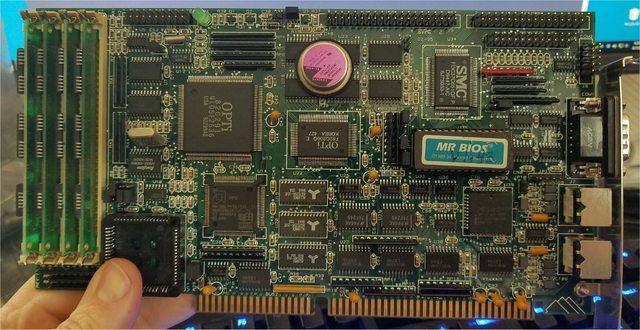 I'm desperately searching for the ETEQ Cougar (82C491/82C492 chipset) version of MR-BIOS for quite a while, so if anybody owns this BIOS, I would highly appreciate a ROM dump! 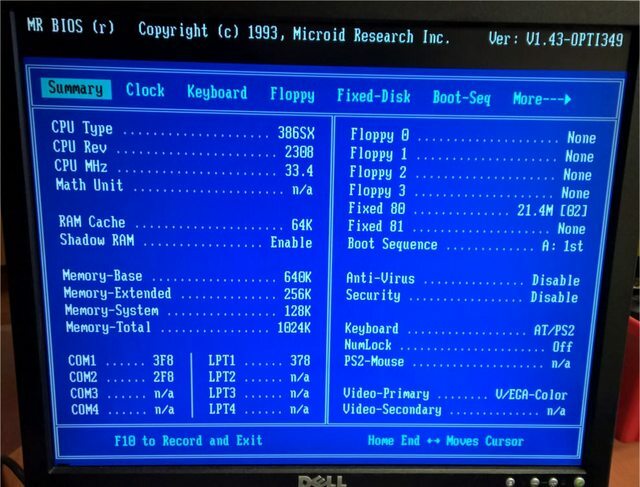 If anyone finds an MR BIOS for the VIA VT82C496G, please hit me up. I looked by myself but didn't find anything. It's important to remember that things have to be old before they're antique. I have no idea why, but recently I decided to build vintage DOS gaming machine. Maybe I just wanted to introduce my kids to the fantastic world of good old classic games. Regardless...., that lead me to discovery of this forum. I guess I was not the only one who did. I used to own 386DX40 with MR.BIOS and mainly for sentimental reason I am trying to build a box with said ROM again. I knew it would not be an easy task, because even back then MR BIOS was something unusual. I liked it for its simplicity, warm boot option, hardware cache on/off keyboard sequence and simply probably because it was unique among ubiquitous AMI. Initially I wanted a build based on Socket1 with AGP graphics, but after browsing hundreds of ebay listings and this forum I realized that the most I could find with MR is Socket 5/7 Pentium PCI based motherboards. 1. From your experience; what would be highest CPU (speed/model) supported by MR.? 2. What would be highest chipset that MR supports in regard to graphics architecture (ISA, PCI, AGP, VLB)? 3. Is it better to look for a motherboard with MR (quite difficult taks), or buy one with AMI/Award and then upgrade to MR (not easy either)? I apologize if some of these questions repeat, but the more I read, the more confused and overwhelmed I am. I am impressed with huge knowledge members possess, and I am far from finding the right answers without your help. What are my options? Last edited by mat919 on 2018-11-05 @ 12:20, edited 1 time in total. These are chipsets. How do I translate these to actual motherboards names? Searching for most of these gave me no viable results. Any luck finding some good Pentium mobos with MR? I would appreciate some actual names, numbers, revision numbers. Something I can use when browsing eBay. Hmm...that's odd. I was pretty sure that the archive of MR-BIOS for socket 5/7 baords was extensive and largely intact. Did you check the backup of the metropoli ftp? where do i find the backup? There are literally dozens of MR BIOS roms here.. I can't tell exactly which one is which since they are listed by numbers. likely have to boot the "Install disk" to see if the cd has a bios first. then you use the utility in windows to copy it to the floppy and then boot the floppy again to use it. Tested on a PB 640 and Advanced EV motherboard and both ended up with MR BIOS 3.46. Im also curious what the differnce in the different versions of the disk are. since I have V1 of the cd.